When making a decision, which do you choose often, your gut feeling or your systematic thinking? If you answer your gut often rules because of its accuracy most of the time, science will back you up. In spirituality, intuition is linked with telepathy or premonition and in understanding something based on unconscious reasoning. But in science, it has more to do with past experiences and pattern recognition. Basically, intuition is the inner unconscious knowing that leads you to some conclusion. Some speculate that this knowing is a result of your subconscious mind processing information much faster than your conscious mind. 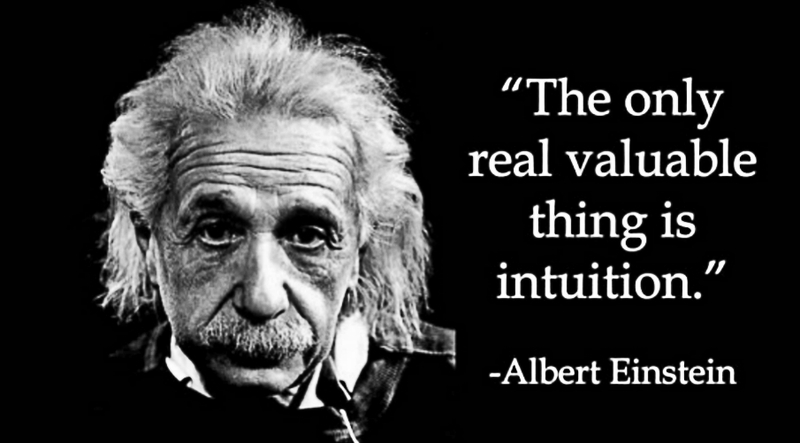 What Science Says About Intuition? Numerous studies were conducted to see how intuition works. One study involves challenging the participants to recognize the layout of a chess game for 5 seconds and recreate it after. Novice chess players were able to reproduce 25% of it while the chess masters recreated it with 95% accuracy. However, when the task was repeated with the pieces of chess in random positions, both the novice and masters recalled only 25% of it. This doesn’t show that there’s something special with the chess masters’ memory. Rather it shows that the knowledge and intuition gained from practice over the years helped them recognize the pattern. How Fast And Slow Thinking Are Linked To Intuition? Our brain processes information through fast and slow thinking. Slow thinking applies to math problems, which creates a stress response to the brain and provokes it to think slowly. Being presented with images, like a sad looking person evokes fast thinking. And it’s in fast thinking where intuition lies. Because we have to process high chunks of data in a faster time than this operations go below our conscious part and are done in the subconscious mind. This unconscious reasoning is what some scientists say the sense of intuition comes from. What A Japanese Study Found Out About Intuition? Another study involved the Japanese board game shogi. Shogi experts were asked to identify a checkmate move for 1 second with no time for conscious analysis. Their brain scan showed that there’s no activation in the shogi player’s cortex, which is the part of the brain for conscious thought. It’s the basal ganglia, that part of the brain responsible for habit formation and automatic behaviors, which was triggered. Making complex decisions, such as buying a house, needs careful thinking that involves weighing the pros and cons and tiny details, like the size, prize, location, and neighbors. The participants in the study who used their snap judgments performed better than those who took into account a subset of relevant information that was less accurate. The study even found that those who followed their intuition were more satisfied with their decision in the long run compared to those who carried out their thoughts more carefully. Yet, on making simple purchases, like buying a toothpaste where the variables are less complicated, the study found that intentional thought and research could be helpful. How Is Intuition Linked With The Skin? In a study of voice recognition, participants were led to listen to a recording of many voices in succession. Surprisingly, only 25% were able to recognize their own voice. The participants’ skin conductance were also measured during the process. When their own voice came on, the participants’ skin conductance went higher even when they didn’t consciously recognize it at first. The same phenomena were also found in a study using a deck of cards. The participants were to select cards that can either be good or bad. Without their knowledge, decks A and B had more bad cards while decks C and D had more good cards. The participants didn’t know what was going on even after choosing 10 cards. Upon reaching 50 cards, they started to suspect that some cards were better than the others. It’s only after they reached 80 cards they were able to point out that A and B were bad cards and C and D were good. Even if they knew it consciously, their skin conductance rose higher as early as 10 cards, which means their skin already knew the right choice before their conscious mind did. But this has nothing to do with their skin. It’s their unconscious mind that was at work. Their unconscious mind recognized the pattern before their conscious mind had. Should We Always Listen To Our Intuition? Following our intuition might be a wise decision. But in cases of empathy, listening to intuition might not work as accurately as systematic thinking. Another study involved over 900 participants who were to interpret and understand the feelings of others. The study found that the participants who used more systematic thinking or carefully analyzing the information available before making a decision were more successful than those who only felt what seemed to be right. Past experiences formed our intuition. It’s this tool that our ancestors used in determining the friend from the foe. Science says that we’re given two forms of thinking, fast and slow. We will follow them both under the right circumstances. So, should you trust your intuition? Of course, when the situation calls for it. Our body and subconscious mind recognize the pattern through past experiences much quicker than our rational mind does. And our gut knows better than our conscious self.